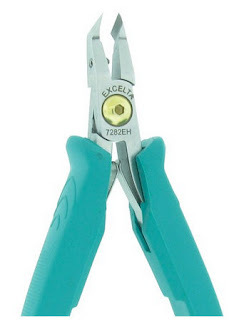 While Excelta manufacturers a variety of cutter tools, for the purpose of this blog post we'd like to zero in on a very popular shape of Excelta Cutters: Angled Head Cutters. Excelta Carbon Steel Angulated cutters come in both maximum flush and fine tip, optimum flush varieties. Additionally these cutters, are available in both long and standard handle sized options. 7104E - 6" long, cutting capacity .003" - .025"
7172E - 5.25" long, cutting capacity .005" - .032"
7175E - 6" long, cutting capacity .001" - .018"
7182E - 6" long, cutting capacity .003" - .025"
7204E - 5.25" long, cutting capacity .003" - .025"
7272E - 5.25" long, cutting capacity .005" - .032"
7275E - 5.0" long, cutting capacity .001" - .018"
7282E - 5.25" long, cutting capacity .003" - .025"
7183E - 6.0" long, cutting capacity .001" - .010"
On the other hand, Excelta also offers a premium, Angulated, Maximum Flush Cutter known as Excelta 7282EH. This cutter features a standard sized handle of 5" and offers a cutting capacity of .003" - .007". Unlike the cutters that are made of Carbon Steel, this cutter offers the user ease in cutting exceptionally hard wires. Tungsten Alloy material allows this as it is made from a special blend of tungsten cobalt, vanadium, and chromium. This cutter is manufactured with a unique heat treating process which transforms it into an exceptionally hard material - able to cut tough edges without difficulty. (66/68 rockwell "C"). 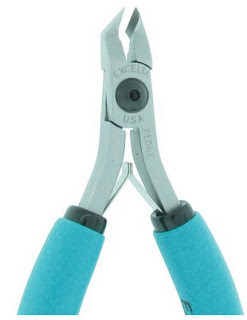 To shop all of these cutters visit us on our Excelta Angled Head Cutters page today.